I’ve begun doing some preliminary data warehousing of VFP data into MySql in order to test the speed, similar to what I did a few posts back with Advantage Database Server. Since MySql can’t just use VFP tables the way Advantage can, I created a script to manually load the already extracted and transformed data into an actual MySql database. Thanks to VFP’s SQLPREPARE() and SQLEXEC() passthrough commands, it didn’t take too long to load the data (about 4 s. per campaign per day, which is about 250 records/s.). The id column will be a 20-digit character field. On a whim, I tried using a DSN rather than a connection string. It didn’t work either, but at least I had access to all of the options. The one that first looked interesting was the one that said “Treat BIGINT columns like INT columns.” Hmmm…not exactly what I’m looking for but let’s try it. So how do we make that work with a connectionstring, my preferred method since I can keep those in a table and not have to distribute it to each machine? I suspect it has something to do with the OPTION= clause in the string, but I’ve never found that to be well documented. However this time when I googled around a bit I found this page, which perfectly laid out how the options in the DSN map to the OPTION= clause. Yay! In a MySQL connection string for ODBC, a parameter called OPTION can be specified to change the behavior of the server. It works as a bitmask, so to use it just take whatever flag you need from the following list and sum up the corresponding numbers, then put that as the value to the OPTION parameter. There is another drastic perf. improvement if you set “Do not cache Forward only cursors” But you will not be able to use shared connections or more than 1 connection at a time then nor run the connection async or you get an “SQL out of Sequence” Error from the Driver. There are some bug reports on those and they hopefully get fixed in the future. I had “solved” the problem by casting the result as Decimal so it took me a couple of days to come back here. Is your number a typo? If not, I couldn’t see what other options you had combined to reach that number. The option is cumulative, like VFP’s MessageBox() parameters. So 16387 = 16384 (Treat BigInt as Int) + 2 (Return matched rows instead of affected rows) + 1 (I have no idea what this is). I also don’t know why 16384 works. But it looked like the most likely candidate so I tried it and it fixed my problem so….voila. How can I run VFP-MySql programme in a client machine without installing MySql ODBC driver but keeping all MySql files in my programme folder. Prabir, you pretty much HAVE to install the ODBC drivers to get VFP to talk to MySql, even if it’s all on the local machine. I’ve heard of workarounds, but they’re not easy. It seems to me that – since there is no direct equivalent to BigInt in VFP, one option (the one selected) is convert the value to text. You can then convert the resulting text back into a numeric value after receiving it (using the VAL(c) function. Of course, that adds to processing time (on both ends), but does give you the capability of receiving records with a BigInt of greater than 4.2B (4,294,967,296 unsigned). Options, is it possible to set multiple options in the string? 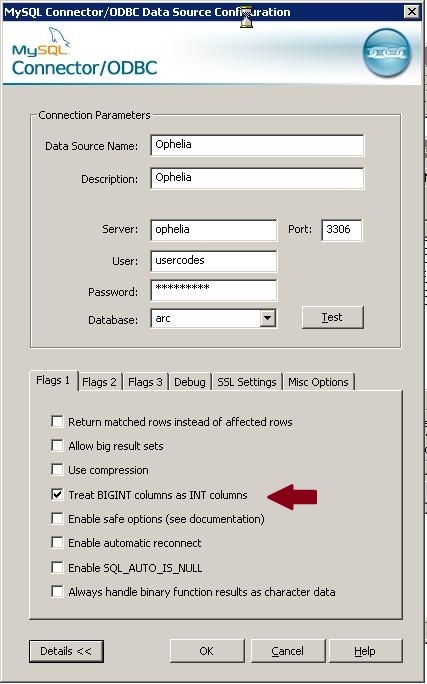 @Balaclava Yes, check out http://dev.mysql.com/doc/refman/5.0/en/connector-odbc-configuration-connection-parameters.html#codbc-dsn-option-flags to see how to translate the options on the GUI into a value that you add to the connection string. You can resolve issue SELECT SUM(field) and return CHAR?